One of our regular recipe contributors from our You Caught It, You Cook It department has a new book out just in time for Valentine’s Day. 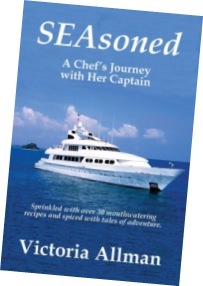 Author and yacht chef Victoria Allman has just written and released her second offering - SEAsoned: A Chef’s Journey With Her Captain. The book is a delicious travel adventure that takes readers on a journey aboard a yacht into the heart of working for your husband and staying afloat during the first year of marriage. 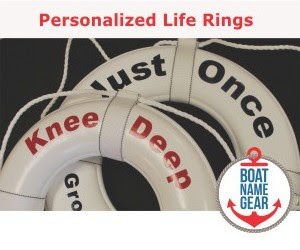 If you are looking for the perfect gift for someone who enjoys boating and cooking, then look no further than this tale from someone who has been there and done that. Victoria has been a yacht chef for 12 years and has traveled through the Caribbean, Europe, Asia, Africa, Australia, the Bahamas and the South Pacific gathering recipes and tales for her stories. Take two adventurous newlyweds, place them on a floundering yacht wrought with problems. Make the husband the captain and boss of his wife the chef. 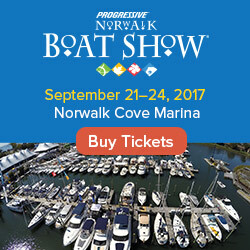 Add two inexperienced crewmembers, an anorexic diva and her bully of a husband, a CEO who thinks he’s in charge, a randy wife who is bored of her own marriage and looking for a diversion and a drunken first mate. Stir it up with a violent storm and rapidly flooding engine room. Apply pressure and watch the situation simmer to a boil. Sprinkled with over 30-mouthwatering recipes and spiced with tales of adventure, SEAsoned is the hilarious look at a yacht chef’s first year working for her husband while they cruise from the Bahamas to Italy, France, Greece and Spain; trying to stay afloat. SEAsoned: A Chef’s Journey With Her Captain is available at Amazon, Barnes and Noble, and at Victoria’s website, www.victoriaallman.com.